Baby News, Show News, Holiday News - Lots of News ! NE 2014 - Wer diesmal nicht dabei war - es war auch in Macon schön ! Noch schöner, drei von Fidels Kindern sind selektioniert worden und damit hat Fidi die Vorrausssetzungen zum Elite A Zuchtrüden !! Zuerst Kimbo van het Klotzicht, letztes Jahr nur ganz knapp gescheitert, dieses Mal ganz vorne, wir gratulieren !! Der zweite Kandidat war Henzo de la Tour Saint Genin, Glückwunsch auch an diesen hübschen Kerl !! 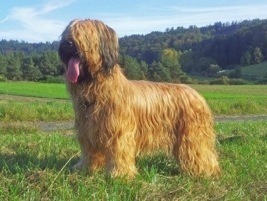 Und zu guter letzt, In scha'a llah Tauntaun aux pattes velues, 16 Monate alt, beim ersten Versuch - wir freuen uns auf mehr bei all diesen tollen Hunden !! Ganz aktuell - Tauni hat Heute zusammen mit ihren Geschwistern Kairos und Igor die Zuchtzulassung bestanden, Fotos, siehe Oben ! Was gab´s noch ? Ferien in der Provence ! In einem herrlichen Haus, hoch oben, mit Postkartenblick in die Gegend und das Ganze 2 Wochen lang, es war wunderbar und ich hoffe, wir werden wieder einmal hinfahren ! lets start with the offspring - Bricoles babys have developes beautifully and will part for their new families this weekend. We wish them only the best and always a friend by their side ! Not quite ready to leave are the little ones in Holland with Berger de la Ruche but they too have developed very nicely ! NE 2014 - for those that didn´t go - it was nice in Macon as well ! Even nicer, three of Fidels babys have been selected and thus Fidi meets all conditions to be nominated Elite A Stud !! First, it was Kimbo van het Klotzicht. He only failed by a hairs width last year, this time he was on top, congratulations !! 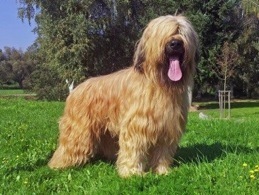 Second was Henzo de la Tour Saint Genin, congratulations to this pretty boy as well !! Last but not least In scha'a llah Tauntaun aux pattes velues, 16 months, first try - we are looking forward to more of all of these beautiful dogs !! 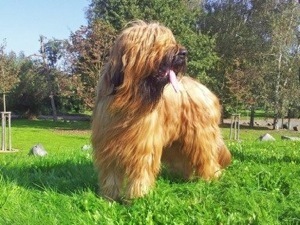 Brandnew - Tauni and her brothers Kairos und Igor got their breeding permissions today, see pics above ! What else ? Holidays in Provence ! A beautiful house with a pictur postcard view of the area, high up in the mountains and all this for 2 weeks. It was great and i hope, we will go again !